When fast pitch softball was a major sport in Peoria, there was perhaps no more talented pitcher than William "Big Bill" Perry. 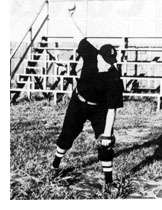 A large righthander who towered over many of his teammates, Perry was a dominating force in Peoria fast pitch softball between 1942 and 1952, compiling records that seemed almost unbelievable. Playing mainly for the famed Gipps Brewers, but also in later years, for LeTourneau and Caterpillar, Perry perhaps hit his zenith in 1945 when Gipps went through a 42-6 season and fought its way into the Midwest regional of the Amateur Softball Association. In that historic season Perry posted a 40-4 record. he allowed just 19 earned runs, produced 24 shutouts, had three perfect games including two in a row, pitched nine one-hit games, and averaged 14 strikeouts a game. In 332 innings he allowed just 39 runs, 117 hits, whiffed 452 batters, and walked just 43. Later, pitching for the LeTourneau Welders, Perry went 9-0 to hurl his team to the championship of the Peoria Triple A league. When Caterpillar joined the National Softball League in 1947, Perry was part of its pitching staff and continued to burn his fast ball past some of the nation's top teams. He passed away in 1972 at the age of 54, the same year he was inducted into the state ASA Hall of Fame.